A new king has arrived to claim the Kickstarter crowdfunding crown. 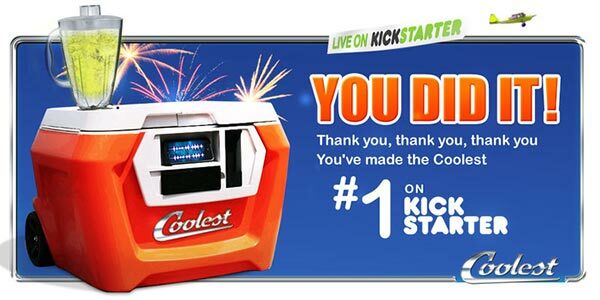 The famous Pebble smartwatch has been displaced from the top of the funding charts by the Coolest Cooler. With just fifty something hours to go the Coolest Cooler has edged past the Pebble’s $10.27 million raised and is currently pushing towards $10.43 million. The project founder, Ryan Grepper, had originally set a goal of just $50,000 and now finds himself over 20,000% funded, with over two days left on the clock. Mr Grepper enthusiastically describes his project product as “60 quarts of AWESOME packed with so much fun you’ll look for excuses to get outside more often”. He certainly seems to have caught hold of the Zeitgeist, looking at the popularity of his Coolest Cooler.